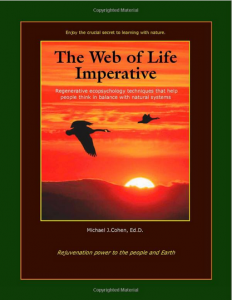 Required E-Book (included): The Web of Life Imperative. In addition to the required e-book all individuals who enroll will receive for free electronic copy of Dr. Cohen’s book Reconnecting with Nature (which is the e-book for the second group course, ECO 501/601 Introduction to Educating and Counseling with Nature), and an online copy of the video Naturally Attracted: Connecting with Michael J. Cohen. You may purchase a Mimbres pin by clicking here. 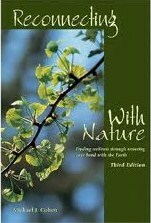 Note: The Web of Life and Reconnecting with Nature hard copy books can be bought from Amazon or other online booksellers. Tuition: Please see http://www.ecopsych.com/orient.html for the most up to date tuition costs. All Students begin with a 1 credit course Eco 500/600 A: Explore Nature’s Wisdom. This course is 4 weeks and costs $50.00. For more information please click here. Credits: 2 Credits applicable to all program tracks. This beginner’s course lays the foundation for all of the courses in this program. Students learn the basic elements of citizenship which are observed in members of healthy natural communities. The experiential activities of the course help students learn through direct sensory perception how these have broken down. They gain a basic understanding of the ways in which members of modern industrialized cultures relate dysfunctionally with nature. Through experiential activities in nature (that students do on their own) and small group online discussions, students explore their senses, learn about the roles of attraction and consent, and discover how to create moments that let Earth teach and inspire. They practice the basic steps of the Natural Systems Thinking Process. Interact Groups of 3-5 students share experiences and insights in email posts once per week. The groups are co-facilitated by a more experienced student, with guidance from the instructor as needed throughout the course. As in all of our experiential group classes, students quickly learn that nature is the true expert here. This course helps most students to decide whether the program is right for them. Midway through the ECO 500/600 (B) course students may apply for admission to the Certificate program or one of the Degree program tracks by completing the Project NatureConnect Student Cooperative Contract.